Ever wanted to take a break from a Moscow traffic jam by hopping in a sauna? Now you can! “If you don’t have time for the sauna, the sauna will come to you!” reads the message on the business card. In addition to a phone number, the card contains the image of a sauna switch of birch twigs and a wooden bucket. It’s not an entirely new invention – Russians in the Urals long ago became adept at converting almost anything that has four wheels for their sauna needs. In addition to mobile saunas, in this region there are also mobile banyas. These are literally small huts on wheels pulled by tractors. Taking into account the unique conditions of Russian back roads, staying on the bench in the sauna must be about as easy as riding a bull at the rodeo. This particularly challenge would be considerably less difficult in Moscow, where the mobile sauna business has just started. But they have also aroused much more suspicion. Why would anyone in their right mind lock themselves in a mobile sauna in the middle of the city? “I’m actually a director. I worked at Mosfilm and this was the makeup trailer where, incidentally, many famous Russian actors had their makeup put on,” said Sergei as he turns up the gas burner that heats the stones and water in the tiny, steamy trailer. 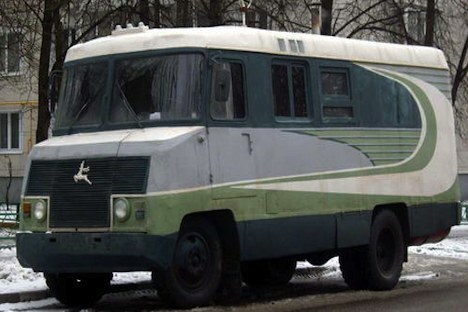 Sergei and his friend Vladimir have been going to the sauna since they were children and they decided to buy the mobile makeup trailer and turn it into a steam room on wheels after they saw it sitting unused in a Mosfilm courtyard. Over three years, they managed to think through every detail, such as where to keep the water and how to heat the stones and regulate the temperature in the steam room. According to them, there is enough water and electricity to sit in the sauna for 12 hours. Before becoming a director, Sergei was an engineer, so he and Vladimir built the entire mobile sauna themselves. This is essentially what happens: an impressively sized minibus parks on a Moscow sidewalk and looks totally normal, except for the smoke coming out of the pipe on its roof. Inside there is a steam room in which four moderately sized individuals can fit if they squeeze their knees together as well as a tiny shower that trickles out hot and cold water, a sitting room with a table and two benches and a partition with a window. Tea and empty cups are handed through the window along with to sensible advice from Vladimir and Sergei. The friends only decided to rent out the sauna in December, but it’s obvious from the small things (jars with oil, body masks, sauna caps and ideal cleanliness) that this strange construction is probably their favorite toy. The main thing to remember when setting out for a trip in the mobile sauna is that even the simplest action can take much longer to do than usual. Taking off your pants is an adventure all by itself. The sauna temperature reaches the necessary 70 degrees by the end of the first hour and that’s when things get interesting. The small trickling from the shower is no longer capable of cooling off your hot body and you would have to spend at least 20 minutes in the sitting room to recover. The only thing you can do is muster up some courage, open the door and go out on the streets of Moscow in nothing but a towel. An old lady passing by with her dog looked at the steam rising from our bodies wrapped in towels and must have thought that she had stumbled upon a mobile bordello. The Englishman Giles Fletcher, the author of notes Of the Russe Commonwealth, described the bathing habits of Muscovites in the 16th century in the following way, “You often see them (to strengthen their bodies) run out of the sauna covered in soap and, steaming from the heat like a pig on a skewer, they jump into the river naked or douse themselves with cold water even in the bitter cold.” I must admit that little has changed since the 16th century as far as the sauna and the nature of Muscovites are concerned. A sauna on wheels would be the best way, for example, to pass the time in traffic jams. But the GAZ-53 truck is stuck in traffic, it’s almost 80 degrees in the steam room and outside the window is the Garden Ring Road and downtown Moscow. What do you do then? Just smoke like a pig.